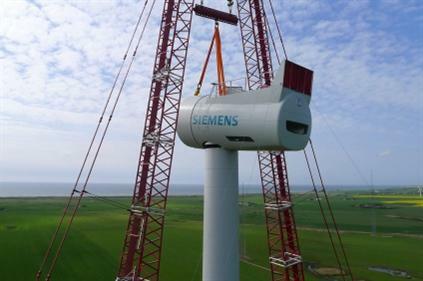 UK: Siemens has received prototype certification from GL Renewables Certification for testing the its 6MW offshore turbine. The test, which will take place at Dong Energy's demonstration site at Gunfleet Sands, southern England, will involve two turbines with 120-metre rotors. Work on commissioning the turbines begun in January and the demonstration project is expected to start generating electricity in spring. The €2.9 billion agreement covers 300 turbines that will be supplied to UK projects between 2014-17. In July, Dong handed Siemens a 1.8GW supply agreement for the 6MW turbine. Speaking abut the Gunfleet Sands trial last month, Morten Buchgreitz, deputy chief executive of Dong said: "The Gunfleet Sands 3 demonstration project marks an important step in industry's efforts to reduce the cost of energy. "The Round 3 projects in the UK are in deeper waters and will have a much bigger capacity than existing wind farms so the technology will increase in capacity as well. "This demonstration project aligns with Dong's ambitions to steer development in the wind industry towards industrialisation to make offshore wind power even more competitive."